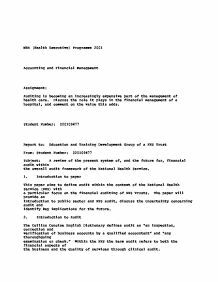 MBA (Health Executive) Programme 2001 Accounting and Financial Management Assignment: Auditing is becoming an increasingly expensive part of the management of health care. Discuss the role it plays in the financial management of a hospital, and comment on the value this adds. 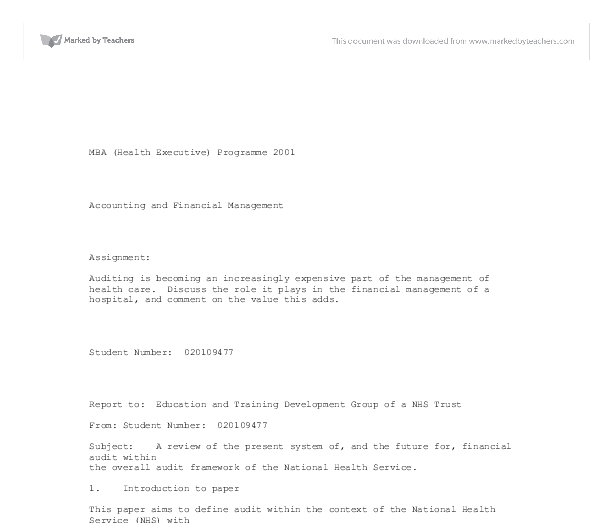 Student Number: 020109477 Report to: Education and Training Development Group of a NHS Trust From: Student Number: 020109477 Subject: A review of the present system of, and the future for, financial audit within the overall audit framework of the National Health Service. 1. Introduction to paper This paper aims to define audit within the context of the National Health Service (NHS) with a particular focus on the financial auditing of NHS Trusts. The paper will provide an introduction to public sector and NHS audit, discuss the uncertainty concerning audit and identify key implications for the future. 2. Introduction to Audit The Collins Concise English Dictionary defines audit as "an inspection, correction and verification of business accounts by a qualified accountant" and "any thoroughgoing examination or check." Within the NHS the term audit refers to both the financial aspects of the business and the quality of services through clinical audit. The key purpose of financial audit is to ensure the appropriate use of resources, within the public sector this primarily relates to the use of tax payers money. Therefore, the Government must ensure audit is an essential part of Parliamentary and public sector bodies processes. The National Audit Office (NAO) (2001) stated "accountability for the use of public funds is a cornerstone of democratic government." The demonstration of this accountability is through the process of audit which provides an independent and skilled assessment that the financial accounts accurately reflect the financial position of the organisation and that resources have been utilised effectively. In carrying out this duty all public sector organisations are responsible for "putting in place proper arrangements for the governance of their affairs and the stewardship of the resources at their disposal" Audit Commission (2002c). ...read more. The annual accounts have to be sign by the accountable officer, and external auditors, to demonstrate that they are satisfied that the accounts reflect the actual financial position, that they comply with statutory requirements and that proper practices have been observed in compiling the accounts. The account standards are laid out in the FRS and SSAP (taken from xrefer website). NHS Trusts "submit a Statement of Internal Control (SIC) as part of the audited annual financial statements" (Department of Health 2002). This process is repeated at the higher levels of the NHS hierarchy and ultimately the Chief Executive of the NHS has to sign a SIC on behalf of the whole service and must answer to Parliament through the Public Accounts Committee (PAC). For NHS Trusts the Head of Internal Audit must produce an annual report for the Audit Committee to consider and accept, or amend, as appropriate. There is an annual audit report from Audit Committee that demonstrates its internal control work. External auditors have a duty, for NHS bodies to inform the Secretary of State (or the National Assembly for Wales) when they believe NHS Trusts have made, or will make decisions that are potentially illegal, or will result in misappropriation of resources. 8. Added value of Audit NHS Trusts are under constant pressure to manage, and reduce costs, any increase, particularly for an indirect patient care service will raise concerns with the Trust Board. Therefore, it is important to consider what added value audit brings to the organisation beyond confirming internal control systems. The findings of the external auditors will be reported within the annual financial statements, therefore it is important for the accountable officer and the organisation, as a whole, to demonstrate proper control systems and the appropriate use of resources. An integrated model of audit can add benefit to organisations by responding to the complexity of services and performance management requirements. ...read more. This is primarily due to the integrated audit approach, increasing the regulation of auditors (and the associated costs of regulation), the possible restriction on company activities beyond audit and the increasing numbers of organisations requiring an audit process. A general management trend, which increases the need for audit, is the devolution of managerial and budgetary responsibility to service managers, this makes systems of internal financial control more complex and therefore the associated risks for internal control are increased. The use of Information and Communication Technology (ICT) can reduce the complexity of work, however, it increases the need for control in terms of security systems and monitoring transactions. There are a number of initiatives to reduce the burden and impact of audit, these include collaboration between internal and external auditors, as set out in the NAO good practice guide on the subject. The role of the new CHAI may also reduce the time spent on separate audits. There will be a need to share the findings and reports by the different auditing bodies, in order to minimise duplication of work. The development of the pilot for shared services for the high volume transactional financial processes may negate some of the complexity of audit, however, the trail for audit to follow may not necessarily become simplified. The pilots for shared services commenced in 2002 and the evaluation process includes "governance arrangements" (National Shared Services Initiative 2002). 13. Conclusions The impact of US scandals have made auditing a high profile subject. The primary purpose of audit within the public sector remains to demonstrate the appropriate use of resources. It is important that the perception of the public and Parliament, through the PAC, are satisfied. In specific terms the future of audit is uncertain, however, given the facts identified in this report the demand for and the costs of auditing public sector organisations are likely to become more difficult to control. A key element in delivering effective audit will be the supply of a skilled audit workforce. There may be scope and a need for recruiting people from different professional backgrounds in order to support audit processes. ...read more. If customers have over due bill of �80, they have to �80 plus 10% interest on it which will give total of �88. This has no specific definition for a conceptual framework. Thus a conceptual framework is theoretical in nature, and used a guide in regulating financial reports. However it can be described as " a set of basic principles that command general support and can be use d to help with detailed decisions by in increasing the likelihood of consistency and reducing the costs of analysis. ":- B.Carsberg, external financial reporting, 1984. This is now fixed through hedging the risks. Another risk which can be discussed is that of market risks which are closely linked with interest rates, equity return and foreign exchange. 'going concern' - this is the assumption that the business will continue to trade for the foreseeable future, and so assets are valued at historic cost, less depreciation if applicable, rather than at their forced sale value at the accounting date. their business income is counted alongside any other personal income they have for tax purposes, so accounting is relatively straightforward. Their tax is calculates via the annual self assessment process. So which means the sole trader will have to pay tax on their profits. The external users of accounts would be unlikely to receive the information necessary to make rational decisions, if managers were given complete freedom to determine the content of published financial statements. Over the years, regulators have acted on behalf of shareholders, creditors, employees and others, to develop a number of rules, which govern financial reporting.